SCORR recently launched a completely renovated website for LifeConEx. What follows are some thoughts on the creative process from the SCORR team that built the new website. When we create a new website for a client, we often also help the client launch a new brand. The situation with LifeConEx, a SCORR client since 2009, was different. This company has a great brand but it had added a lot more services and technologies to its offerings, and its website needed a major overhaul. So, we focused on developing the strategy behind the brand with an eye toward what LifeConEx is, what it aspires to be and how we could best accommodate the different audiences that would visit the website. This helped us figure out a few key features for the new site. One of those is the Cold Chain University, which is a great resource for anyone involved in temperature-sensitive transport, and shows LifeConEx’s commitment to educating the industry on the latest in cold chain optimization. We did some unique things with this website, such as subtle animations (check out the home page), simplified call-to-action forms and interactive features that help keep content engaging. 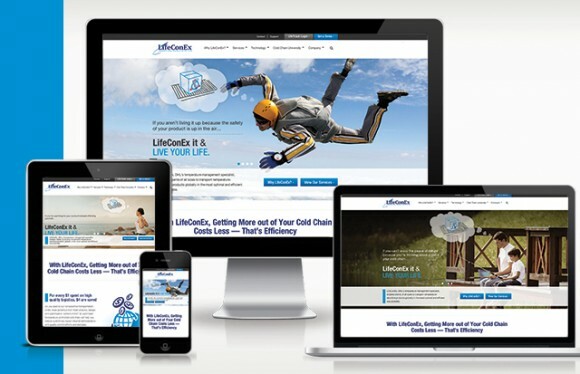 Communicating a brand’s overall message can sometimes become an obstacle in itself, but this site showcases how we used LifeConEx’s brand and its elements to explain who LifeConEx is and what it does. One big step for our team was making the website mobile responsive (try opening a page and resizing your browser window). There are so many interactive elements and supporting graphics on this website, which could be problematic when viewing on mobile browsers. To resolve these concerns, we spent a lot of time plotting out what content would be visible in what views. We thought about the end users — how they would interact with content on a phone instead of a laptop, for example. Throughout the site, the content has a lot of room to breathe and is supported by graphics that serve to continue the story without getting in the way. We’ve been closing — pretty much eliminating — the gap between the copywriting and design teams when we develop websites. Before we got started drafting copy or layouts for LifeConEx’s new site, we made sure to define who would be visiting the site (new visitors, returning visitors, current clients, etc.) and what they’d need to get out of it. This is standard practice, but our approach was really special for this website because we aimed to create an experience, not just a repository of information for visitors. We thought through what we’d want new visitors/potential clients to get out of the site on their first visit, and then developed content to facilitate that. In a sense, we reverse-engineered the entire site to build specific pathways for specific visitors (which we call “user pathways”). The Why LifeConEx? page is a great example of this. It features content with a really clear purpose: If you’re not familiar with LifeConEx, what it does or the value it delivers, this page will give you a comprehensive understanding.